Repeated winner of the Associated Builders & Contractors STEP Safety Awards in Silver, Gold, and Platinum. 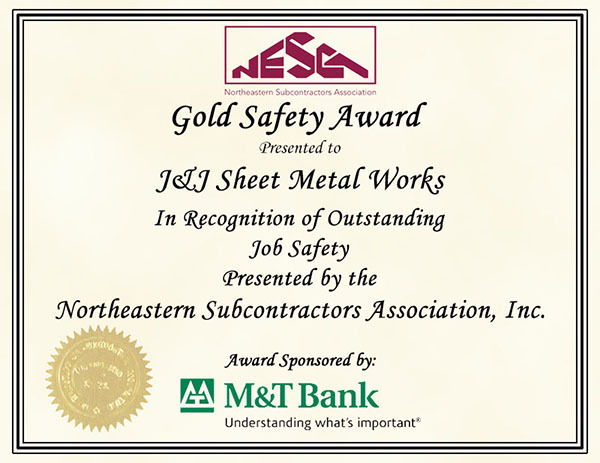 Repeated winner of the Northeastern Subcontractors Association Safety Awards for five years in a row. We take an organized approach to analyzing, developing and auditing our company-wide safety programs. Our efforts have not gone unnoticed! Our repeated recognition not only demonstrates our commitment to safety but also provides our customers additional piece of mind when evaluating our bids and responses for proposals. It's also important to note that STEP Safety Award recipients beat the Bureau of Labor Statistics national averages in several areas, leading to benefits both when bidding for business and negotiating insurance rates. Winners of the Associated Builders & Contractors STEP Safety Awards and Northeastern Subcontractors Association Safety Awards for several years.